For generations, parents and teachers have turned to fables to inspire moral behavior among children. Some of the most popular stories teach the importance of telling the truth. A recent study, however, finds that fables that punish the main character for lying are less effective than those that reward honesty. A group of child psychologists set up a simple experiment using the three most commonly told stories to promote honesty among children: "Pinocchio," "The Boy Who Cried Wolf" and "George Washington and the Cherry Tree." These stories were also chosen because each one attempts to inspire honesty in a different way. In "Pinocchio," lying results in immediate negative consequences (when he lies, his nose grows longer). In "The Boy Who Cried Wolf," lying has dire negative consequences; the little shepherd boy lies so often about being attacked by a wolf that when a wolf really appears, no one believes him, and he and his sheep are eaten. In contrast, "George Washington and the Cherry Tree" emphasizes the positive consequences of honesty. When George tells his father the truth about cutting down the cherry tree, his father praises him. The researchers worked with a group of children, between 3-7 years old. Each child played a game that required guessing the identity of a toy based on the sound it made. In the middle of the game, the experimenter left the room for a minute to grab a book, instructing the child not to peek at the toy that was left on the table. For most children (and, I'm guessing, most adults) this temptation was too hard to resist. Specifically, we predicted that cheaters who heard "The Boy Who Cried Wolf" would be more inclined than cheaters who heard the other stories to confess their cheating because of the fatal consequence associated with lying in this story. However, we also predicted that this effect would be seen only in older children, who might be better able to appreciate the finality of death than younger children would…. 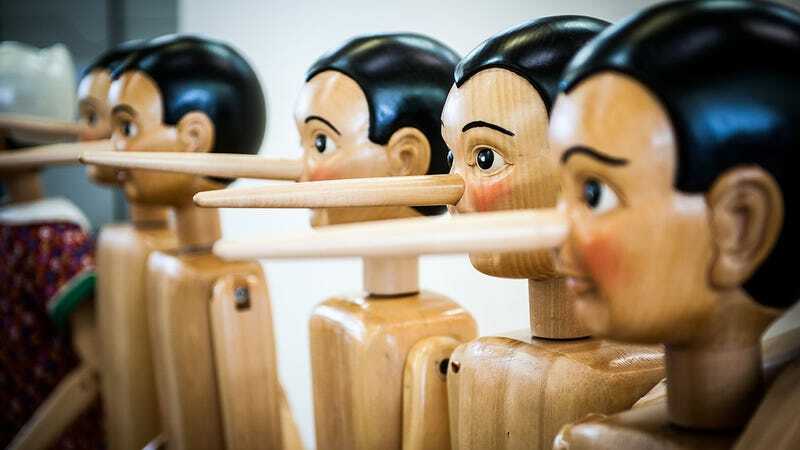 We expected that children who heard "Pinocchio" would also become more inclined than other children to confess their cheating because of the immediate physical consequence that Pinocchio suffered when he lied. Public humiliation should be readily relatable, even to young children. Thus, we predicted that this story would be equally effective in promoting honesty in children of all ages. We also hypothesized that "George Washington and the Cherry Tree" would be effective in promoting honesty at any age because it illustrates the benefits of honesty in a concrete manner. But, the only story that significantly increased children's honesty, regardless of their age, was "George Washington and the Cherry Tree" — which suggested that emphasizing the positivity of honesty is the most effective approach. In order to further test the theory, the researchers added a fourth tale: they invented a version of the George Washington story with an unhappy ending (George's father punishes him by taking away his axe). Sure enough, they found that this negative version did not inspire kids to tell the truth. Their conclusion: young children are more likely to be honest if they believe they will be rewarded for telling the truth instead of being punished or humiliated if they are discovered to be lying. The psychologists, of course, don't say that Pinocchio is a "harmful" story for kids. It's still a wonderful fable. Just don't expect that a long nose will inspire children to always tell the truth.